Solve Your Child’s Foot Problems Today! It’s funny how things have a way of coming full circle in life. During the early seventies, Sesame Street was a cornerstone of my childhood. Now, after of 41/2 years of parenthood, the show still captures my attention and it helps me explain the world we live in. The creators of the show have proven that the combination of entertainment and learning can create an enjoyable and meaningful experience. Although there are thousands of episodes and characters, I am sure everyone has their favorites. I am partial to episodes that deal with Elmo’s World on the Feet Channel, “the channel that keeps you on your toes.” My favorite episode is a “feet-ture” film of the “Girl Who Loved Her Feet!” In the opening scene, a young blond teenager climbs to the top of a little green hill in her bare feet and says,” I love my feet!” Then, she bends from the waist down and kisses her big toes. This girl does everything with her feet; and goes everywhere with them. She runs down hills, goes for long walks, plays at beach, waddles in the mud, jumps rope, and goes dancing. When she goes to bed at night, she even kisses her toes and her dog Tootsie licks them. OMG! When your child falls or trips more than usual this may be a sign of a neuromuscular or balance problem or an in-toeing problem. Plantar warts are caused by a virus that can develop anywhere on the foot. They are a common occurrence in children and adolescents. Over-the-counter medications can be used but your podiatrist will have other more effective remedies like acid treatment to the affected site or laser treatment that will allow your child to return to normal activity immediately. Other problems that typically occur during adulthood can also occur during childhood. These include plantar fasciitis, Achilles tendonitis, and stress fractures. These conditions are fairly typical among youths who participate in rigorous sports like soccer, football, tennis, running, or activities like dance, cheerleading, and martial arts. Again, the faster you seek medical attention the better it will be for recovery and speed their ability to return to sport. Other medical conditions like cerebral palsy, polio, club foot, multiple sclerosis, epidermolysis bullosa, and muscular dystrophy may lead to foot deformities. 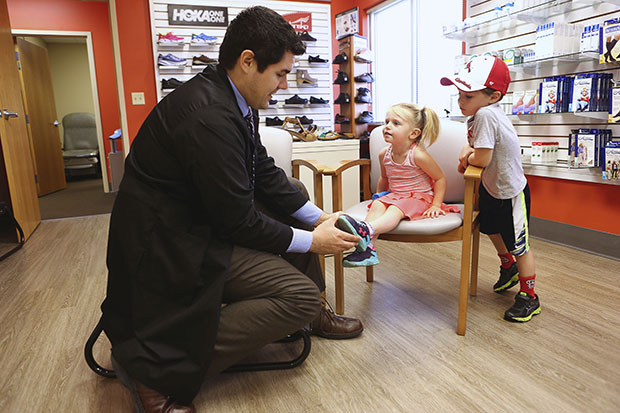 Your podiatrist can recommend several shoe brands for children who have special foot care needs. Sometimes, a foot or ankle problem is not easy to detect in a child because they are not able to articulate how they feel or what is bothering them. As a parent, it is important to inspect your child’s feet regularly and to observe any of these warning signs. Visit myfootandanklecenter.com for more information on foot care for your child. Each month, the website posts a fun art project for you to do with your child to raise their awareness of their feet and to promote proper hygiene. For further information or to schedule an appointment, contact the Foot & Ankle Center of Illinois at 217-787-2700. The Foot & Ankle Center of Illinois is located in four convenient locations in Springfield, Decatur, Shelbyville, and Carlinville. Visit the patient library at www.myfootandanklecenter.com to review the literature on foot care for your entire family.